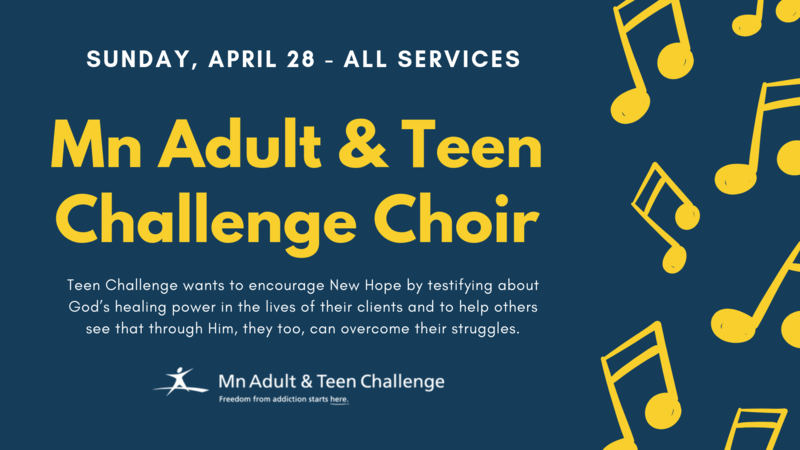 On Sunday, April 28th New Hope welcomes the choir from one of our partners — Minnesota Adult & Teen Challenge! Their Mission is to assist teens and adults in gaining freedom from chemical addictions and other life controlling problems by addressing their physical, emotional and spiritual needs. Their choir seeks to encourage New Hope by testifying about God’s healing power in the lives of our clients and to help others see that through Him, they too, can overcome their struggles. A special offering will be taken at the end of service to support their ministry. PLEASE NOTE: THERE WILL BE NO LIVESTREAM THIS SUNDAY DUE TO SOME OF THE CLIENTS BEING VULNERABLE ADULTS OR FOR OTHER LEGAL REASONS.